Open: April - October... Sun Palace Hotel is a peaceful, relaxing hotel situated 300 meters from Faliraki Beach, the most popular beach in Rhodes. The hotel is within a short walking distance from Faliraki Square (shopping center) 600 meters and 5 km from the 18-hole Afandou Golf course. The hotel consists of 235 hotel rooms, bungalows and family rooms spacious and comfortable. They all have feature individually controlled air condition, mini refrigerator, direct dial telephone booth, radio, satellite TV, bath and balconies or patio. Reception, foreign exchange, mini market, safe deposit boxes, full excursion program, car hire and parking area. Large swimming pool, children's pool, sun terraces with umbrellas and spacious sun chairs, tennis court, mini golf, table tennis and children's playground, billiards, back gammon and chess. The hotel offers to its guests a full day and night soft animation program (in high season), featuring among others Greeks nights with Folklore show and animators Theme Nights. 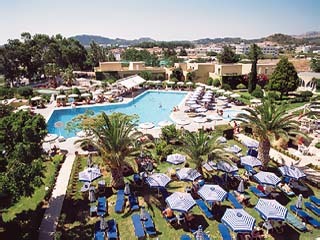 The hotel's main restaurant with its adjoining terrace offers buffet style breakfast, lunch and dinner. The Snack Bar offers a choice of snacks, in between meals and scooped ice-cream for the young guests. A choice of two bars is available to all hotel guests which offer a wide selection of cocktails and refreshing long drinks.